Shop our aftermarket Savage arms Stevens 320 shotgun accessories for sale. We offer Stevens 320 collapsible stock kits with tactical pistol grip and recoil pad with sling attachment points. 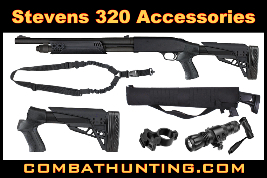 Get Stevens 320 tactical shotgun accessories, sling, gun cases, stocks tactical flashlights and mounts at great prices.